The new 2019 Mercedes-AMG G63 has undergone the greatest change in its history - while remaining true to its well-proven virtues. The G63 underpins its unique position among performance off-road vehicles with a powerful drive system, an AMG-developed suspension, AMG-specific transmission modes and a new interior with optimal widescreen cockpit. The basis for the hallmark AMG Driving Performance both on and off road is provided by the 577 hp handcrafted AMG 4.0-liter V8 biturbo engine, rear- biased all-wheel drive (40:60) with three differential locks, extremely fast-shifting 9-speed automatic transmission, double wishbone independent front suspension and adaptive adjustable damping. The reinterpretation of the unmistakable design creates strong highlights with the AMG-specific radiator grille, flared wheel arches, striking side pipes on the exhaust system and wheels up to 22-inches in diameter. The handcrafted AMG 4.0-liter V8 biturbo engine now also replaces the previous 5.5-liter V8 biturbo engine in the G63. It generates 577 hp in this model, and delivers a maximum torque of 627 lb-ft. 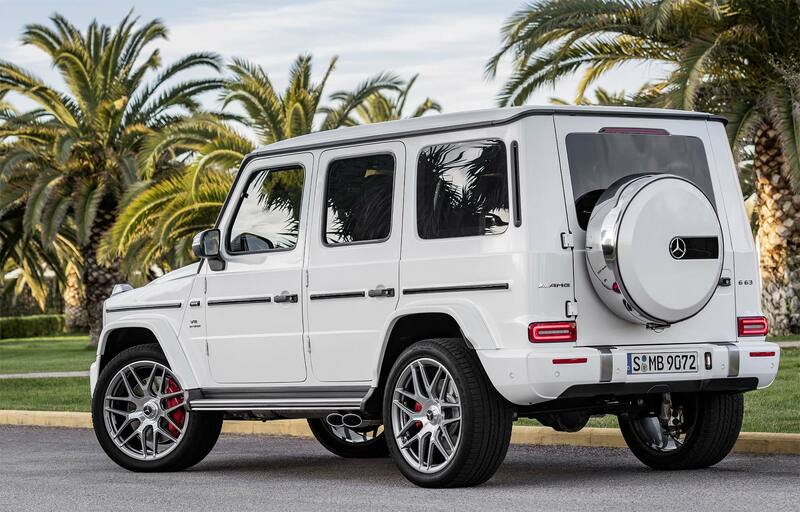 This is available across a The handcrafted AMG 4.0-liter V8 biturbo engine now also replaces the previous 5.5-liter V8 biturbo engine in the G63. It generates 577 hp in this model, and delivers a maximum torque of 627 lb-ft. This is available across a wide rev range between 2,500 and 3,500 rpm, and provides a sense of effortless superiority. The G63 completes a sprint from zero to 60 mph in just 4.4 seconds (est. ), 0.9 seconds faster than the previous model. This dynamic performance is maintained up to the limited maximum speed of 137 mph, or 149 mph with the AMG Driver‘s package.